Electronic court filing is an online and seamless alternative for lodging your NSW Civil Registry court filing. 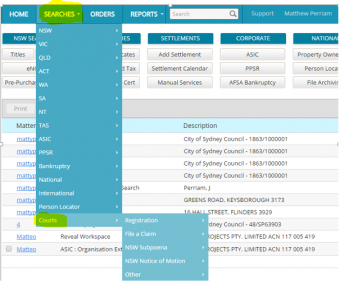 Lodge your court documents for any NSW Civil Registry from the convenience of your desktop. With intuitive online forms and no uploading of signed documents, it’s the simpler, smarter way to lodge through InfoTrack's e-filing system. Inbuilt calculations for Solicitors fees and filing fees. No need to upload physically signed documents. Don’t pay e-Filing fees upfront. Using InfoTrack, the NSW Civil Registry e-Filing Service allows you to easily lodge your court forms for any local, district or supreme registry court from the comfort of your own desk. This significantly reduces the amount of time spent lodging court documents, whether you are currently doing it over the counter, through an agent, or online with the Registry directly. This is the easiest and fastest way to lodge with most documents being turned around within 24 hours. InfoTrack keeps it simple with basic forms and clear instructions every step of the way. We are proud to be in partnership with Easy Court Filing, who created this simple online facility which creates, securely stores, administers and electronically lodges court documentation. Simple and easy to process via your InfoTrack account (see below).